EchoStar’s (S SATS) Sling Media unit launched a revamped mobile app as well as a Roku channel Monday to give Slingbox users more ways to watch TV remotely and on the go. 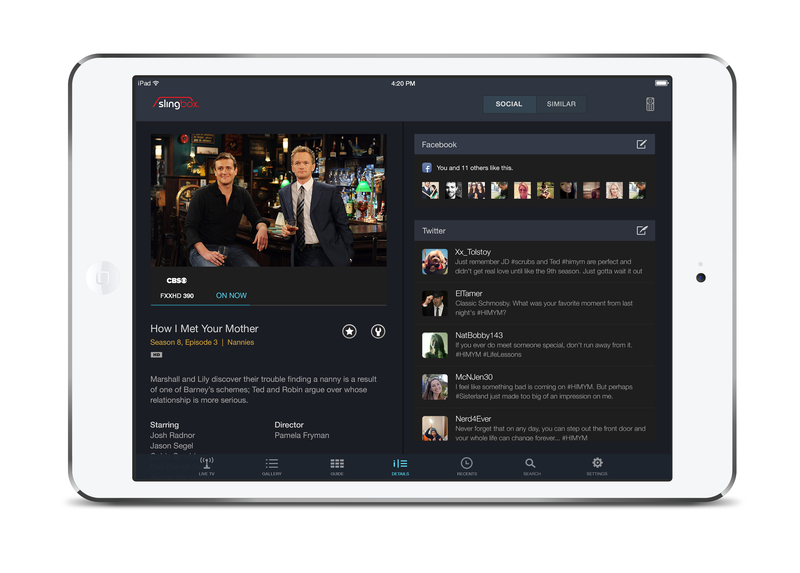 The app revamp comes as Sling is looking expand its relationships with pay TV operators. But as it does so, Sling will have to deal with the same issues that have turned TV Everywhere into a nightmare for consumers. Sling’s new mobile apps integrate Twitter (S TWTR) feeds for individual shows, Thuuz data to highlight which sports games are the most exciting at any given moment and social viewing recommendations based on a viewer’s Facebook (S FB) contacts. All of these features are nice additions to the Sling mobile experience, and the Roku channel in particular has been a long-requested feature amongst Slingbox users — but it’s unlikely that any of these will turn Sling from a little-known product for TV enthusiasts into a mass market success story. “Sling has been a niche until now,” admitted Sling’s new VP and General Manager Michael Hawkey during a recent interview. Hawkey recently joined the Sling team after working a number of years for the corporate parent EchoStar, and he didn’t beat around the bush during our conversation about the way he wants to change that. Sure, Sling wants to grow its retail sales. But Sling also recently struck an exclusive licensing and distribution agreement with Arris, (S ARRS) the set-top-box maker that last year bought Motorola’s set-top box business from Google. (S GOOG) This agreement will eventually lead to Arris-built set-top boxes for pay TV operators that feature Sling’s technology — and Hawkey clearly thinks that this market will eventually be bigger than Sling’s retail operations. “The OEM space is an untapped domain,” he told me. It’s also a market that comes with a whole new set of problems. Cable companies have long tried to offer their customers a Sling-like experience through what the industry likes to call, “TV Everywhere”: Mobile apps that offer consumers access to their pay TV programming on the go. However, while the on-demand programming of these apps is starting to look appealing, live streaming is anything but. Just take the Time Warner Cable TV app. Customers can use it to stream live feeds of 20 channels outside of their own home — but it’s unlikely that anyone is going to use this feature very often. TWC doesn’t stream any broadcast channels like ABC, (S DIS) CBS (S CBS) or Fox (S NWS) out of home, and big cable channels like AMC, USA or HBO (S TWX) are also amiss. Consumers instead get to see BBC America, Food Network and truTV. “That’s not TV Everywhere, that’s TV but everywhere,” joked Hawkey. The reason for these shortcomings is the ongoing power struggle between networks and operators. TV networks would like to keep the lid on their most valuable online assets and instead publish their own TV Everywhere apps, like HBO has done with its HBO Go app. Pay TV operators, on the other hand, want consumers to associate their brands with the TV services they’re able to use, which is why Comcast (S CMCSK), for example, still doesn’t allow its subscribers to access HBO Go on Roku’s streaming players. TV Everywhere is a nightmare for consumers because of these unresolved issues. Sling has long used this to market its own devices, telling TV viewers that they can really watch TV everywhere, without any of these restrictions, if they buy a Slingbox. But with Sling technology heading to cable boxes, the company will inevitably find itself confronted with the same issues. Hawkey admitted as much, and said that operators will be able to block certain channels from streaming through Sling’s software when it becomes part of their cable boxes. At the same time, he argued that the technology could help to push the issue, and force the industry to finally resolve its struggles around TV Everywhere. If it does so, Sling isn’t the only company to benefit. DVR maker TiVo, who also primarily targets operators these days, recently introduced new hardware with Sling-like capabilities as well. And just like Sling, TiVo’s operator business is dependent on the industry solving its TV Everywhere problems. But Hawkey remained optimistic that this will happen, and benefit both companies. “At the end of the day, the market is gonna be big enough for both of us to survive,” he told me. Some companies are doing TV Everywhere pretty well and definitely A LOT better than TWC current iteration – I think the Dish Hopper with Sling and even their older receivers that are eligible to add the USB Sling adapter are a good example of TV Everywhere – not perfect but a lot better than other offerings.